Piano Duet Play-Along Volume 10. Composed by Oscar Hammerstein and Richard Rodgers. Piano Duet Play-Along. Play Along. Softcover Audio Online. 88 pages. Published by Hal Leonard (HL.290557). 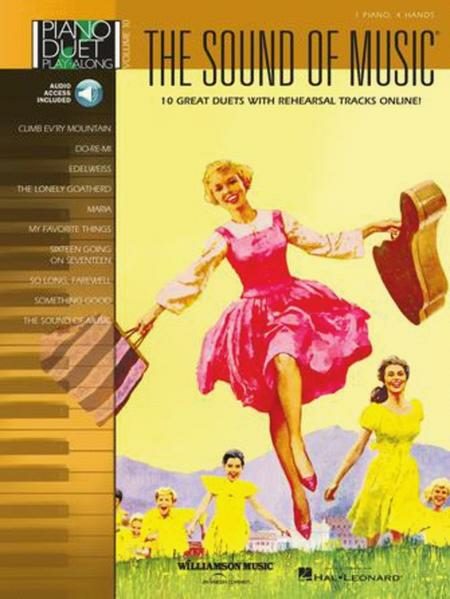 10 songs from the classic musical, including: Climb Ev'ry Mountain • Do-Re-Mi • Edelweiss • The Lonely Goatherd • Maria • My Favorite Things • Sixteen Going on Seventeen • So Long, Farewell • Something Good • The Sound of Music. Includes access to online audio files for when a partner is unavailable.